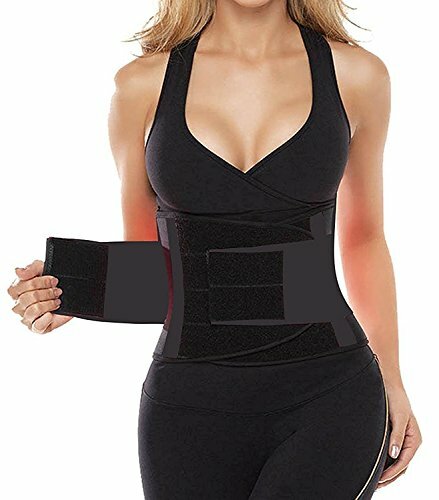 If you are looking for a way to make the most of your training and workout sessions, a well-made waist training belt is your answer. A good body shaper belt can give your back the support it needs to go the extra mile. Posture plays a crucial role in exercise as well. A waist-cinching belt can align the midsection of your body in an optimal position, allowing you to reap the most rewards with the least effort. Camellias Women’s Waist Trainer Belt is just that tool. It improves your posture and helps activate your abdomen during your workout. It targets the fat around your waist and helps burn it. When combined with the right workout routine, the results can be downright surprising. If you want to target your belly fat and are resolved to attain a smaller waist in the near future, you should try this waist trainer! It is a rather simple belt. Its fabric and smart design are where it differs from the similar belts available in the market. Following are some of the features that set this belt apart. This formidable waist trainer belt is available in five different lengths. The lengths of the belts are not to be confused with waist sizes. To get the best results, it is imperative to purchase a belt that fits your waist properly. Are you tired of spending hours in the gym every week, without seeing any results? This belt can help you change that. It can be frustrating to realize that even though you are doing everything right, you are not being successful at bringing your weight down. If you buy this belt in the right size and do not skip your training sessions, you can change trim down your waist successfully. Here are some of the ways this belt helps. The Neoprene fabric works wonders to heat up your abdomen while you are working out. It makes your belly sweat more than normal and helps in spot reduction of fat. The compression of the fabric does not only give you a shapely figure it helps in targeted burning of fat. The material of the belt is completely Latex free. Neoprene is a stretchable material that adjusts to the body well, does not cause any discomfort or irritation, and is easy to wash and take care of. To help your abdominal muscles feel the burn from your exercise and to reduce fat effectively, right posture is vital. This belt forces you to keep your body firm and upright in all the various positions you take during exercise. If your back pain is keeping you away from the gym, this belt is sure to help. It offers valuable lumbar support and keeps your backbone safe during exercise. Your pain is significantly reduced, and your range of motion improves dramatically. It does not only help you exercise with a recuperating injury, but it also helps you injuring your back in the future. The compression around your abdomen acts as a great deterrence against a herniated disc. The mesh options available in Black and Beige offer improved breathability. If you are an avid trainer, the mesh will be better suited to your needs. It keeps your abdomen hot without going overboard and keeps your skin comfortable for the longer duration. The convenience of the Camellias Waist Trainer Belt is its most endearing feature. Simple Velcro straps let this belt hug your torso, and you are ready to tackle your exercise session. The belt is suitable for all kinds of sport- activities like cycling, running and soccer, etc. It enhances your performance by increasing your core strength. Increased sweat can help you burn your calories faster. This is a simple waist trainer belt that aims to provide support during your physical exertions. It does not have any cons, so to speak. However, you should keep the following considerations in mind. When washing this belt, try to hand wash with lukewarm water. Do not put up on a hanger or wring it dry. Try not to wear this belt while sleeping, as it can interfere with your breathing and cause some discomfort. This is an effective waist-trimming tool. It takes your exercise to new heights and helps you burn the difficult tummy fat. The fabric is comfortable, and the belt itself is easy to put on. The belt does not do your body any harm. It seems like a sure-fire way to make your workout sessions more productive. Order one now and see your body change!